Congratulations to all of the Irish stepdancers from Scóil Rince na Trí Chontae, especially our own Katie Kelly, for brilliant work at the grade exams held by Múinteoirí Rince Chúigí na hÉireann in Limerick last Sunday. The exams were a great success, with all dancers passing their respective grades. Well done! Special thanks go to Glengarra Utd. Soccer Club for its support of our local schools. Glengarra Utd. Soccer Club played in the Avondhu North Cork Soccer League for over three years. Unfortunately, due to the clubs in the league being unable to field teams, this league came to an end over two years ago. Glengarra Utd. has decided to donate the funds from their club to the two local, national schools of Skeheenarinky and Burncourt. 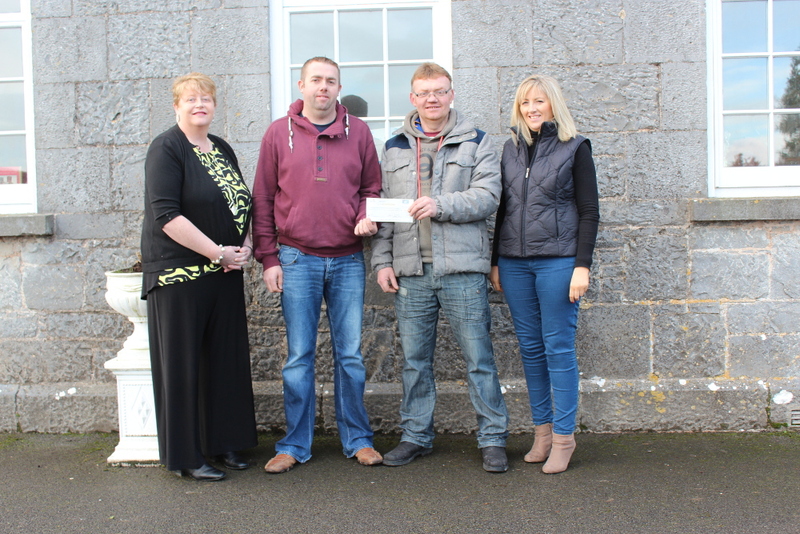 The sum of €1,038.24 was presented to Tom Maher and Susan Walsh of the Parents’ Association at Skeheenarinky National School by former chairperson, Lily White, and treasurer, Eamon Walsh. Contact Eileen Reilly at 0862177471 or eileenrreilly@gmail.com with your stories from the village. Please submit your news by 8 PM on Sunday. Photo; Lily White and Eamon Walsh of Glengarra Utd. presenting a cheque to Tom Maher and Susan Walsh of Skeheenarinky National School’s Parents’ Association. This entry was posted on Tuesday, January 27, 2015 at 12:59 pm	and is filed under Parents' Association News.